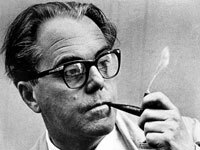 Max Frisch (1911-1991) was a Swiss novelist and playwright. Frisch's father suddenly passed away while he was studying at the University of Zurich, and Frisch had to abandon his studies and take up a job as a journalist, thus beginning his life-long career as a writer. His first novel was published in 1934, but his most active writing period occurred during the 1950s and 60s. Major themes in Frisch's works include identity, individuality, and political commitment. In his presentation of Frisch to the jury, nominating author Adolf Muschg remarked of the laureate, "Frisch is a man of personal and public courage; he has never shied from making his voice heard in matters of common concern and has never sided with the high and the mighty. He has displayed an exceptional gift for finding the right word at the right time," (WLT Vol. 60, Autumn 1986). Frisch's body of work inlcudes the novels Stiller (1954; tr. I'm not Stiller, 1958), Homo faber: Ein Bericht (1957; tr. Homo Faber, 1959), and Andorra: Stuck in zwolf Bildern (1961; tr. Andorra, 1964). Frisch also penned several plays, many of which have been included in various collections: The Fire Raisers: A Morality without a Moral (Methuen, 1962), The Great Fury of Philip Hotz (Dutton, 1967), and Man in the Holocene (Harcourt, 1980) are among these translations.